Have you ever wondered how that phone or kitchen appliance that you own came to exist, or all those products at the local big box store as you wandered the aisles looking for something specific? Everything made by humans around us, whether it be our clothes, cars, furniture, electronics, homes, and everything in them was designed by someone, somewhere. Most people have the impression that products just ‘happen’, and have never given any thought to how they came to be. 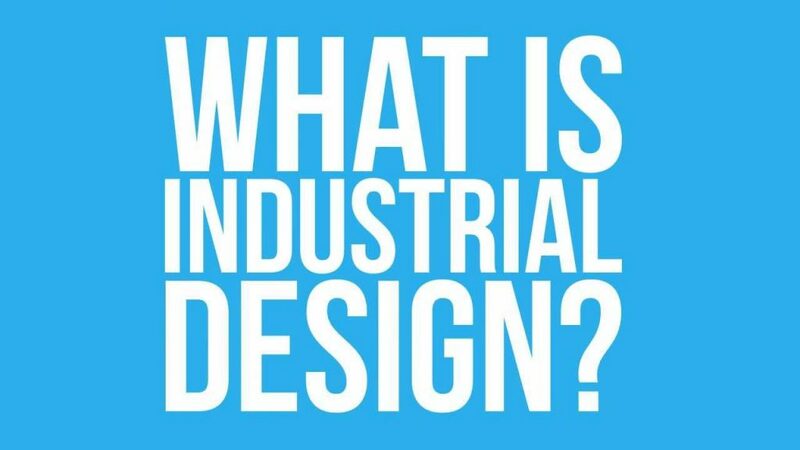 They may never have known anyone involved in the design (or production) of products, or even been aware of the profession of industrial design, which is now more commonly referred to as product design. And yet, there are many people involved in this profession and products are continually being designed and manufactured for all kinds of needs and reasons. Our ancestors who created tools of stone, wood, and other elementary materials were designing products. 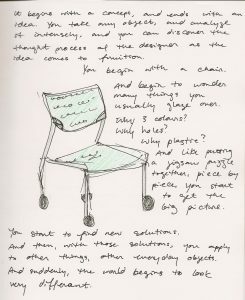 Product design to solve a need is one of our oldest activities as humans, and is seen in all cultures around the world. Today, product designers are specifically trained in the designing of products that are destined for series (or mass) production as opposed to craft production. Where there is a need or problem, you can be sure that there will be a solution designed by someone! The act of designing products is a complex process and is a form of communication of ideas with the goal of solving problems or needs. Creating sketches of ideas is just one form of visual communication that is used to convey the designer’s ideas. Product designers also use presentation renderings, computer-generated virtual 3D models, dimensioned technical drawings, actual real-life models and working prototypes, written communication, as well as oral communication to explain their ideas to engineers, manufacturers, regulatory bodies (where applicable), sales and marketing personnel, management, clients, and any other stakeholders implicated in the design, manufacture, sales and service, purchasers and users, and increasingly, the recyclers of products. Product designers are concerned about materials, manufacturing and assembly methods, ergonomics, sustainability, regulations, and semantics, among others. So, it will be evident that communication is a complicated undertaking in this profession! Mistakes and misunderstanding can be very costly in terms of time and money lost, materials waste, and sometimes the safety and security of both products and their users. It is crucial that designers be competent in these varied ways of communication to ensure success for all stakeholders connected to the lifecycle of a product. 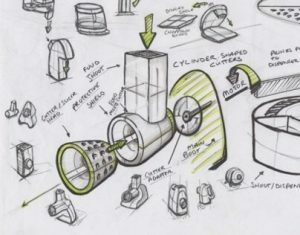 Can Writing in the Disciplines be of value to students in the Industrial Design program at the college? The answer is ‘yes’! Writing and written communication is considered very important, as students will be required to write research reports, project proposals, descriptions of project work, and annotations to design concepts, among other types of writing, depending on their courses’ individual requirements. They are required to be clear and concise in their work to convey what they are thinking, which also allows them to better consider and evaluate their own ideas themselves. Therefore, any techniques which can be of benefit to helping students attain the program’s competencies and to become more autonomous as they progress through the program are welcome. Fortunately, students work creatively in their program courses, so they are already open to numerous project formats and to experimentation. This is an advantage when implementing new ideas as they are more willing to accept change. Through interesting and informative WID group discussions and the excellent accompanying text by John Bean, Engaging Ideas, I found that there were many interesting and appropriate methods of implementing writing into my courses that can create more dynamic and varied learning activities for students, which should lead to more effective attainment of the program’s competencies. For me, implementing WID principles is a continual work-in-progress, an evolution of experimentation and analysis from one course to another. I have found that it is beneficial to me as well as to students, as I consider the results of these experiments and their effect on students and their work. I can adjust content and techniques as necessary and simultaneously maintain students’ interest in course materials. Following are WID activities that I have adapted to and have experimented with in various courses that I instruct. They are listed under different genre categories to enhance students’ growth as writers (communicators) through a variety of assignments. There are links to an example of each one below each description and commentary, where relevant. This WID method of using unannounced, anonymous, ungraded, and sometimes spontaneous writing exercises during class time serves to be beneficial to both students and to me as an instructor. Often, they consist of a one-sentence question or statement that requires students to reflect on a topic and to give feedback, or to write down what they learned in class in a specific way. It can easily be modified to suit a class or context, depending on the desired results. For students, the fact that they are unannounced, anonymous, and ungraded allows them to be more open with their responses, as there is no stress involved. Students immediately reflect on the topic and give written feedback. They are informed that grammar and spelling are not part of the exercise, so they are not to spend time on it. This technique is similar to brainstorming ideas through sketching in design, an activity that they are already familiar with. For myself, it gives me the opportunity to see students’ writing skills and to see who is having difficulty with comprehending course material (depending on the question(s) asked to them). This feedback also helps me with content and the structuring of course material for the next time that I give the course. Students will often not easily verbally admit in front of the class if they did not understand content, so this no-stress exercise has many benefits. I find that many students are still writing at the deadline, evidence that they willingly participate in this kind of activity. Free writing can also be used before a lecture topic to gauge students’ present knowledge of the topic. To give time to read responses and to modify course material beforehand (if deemed beneficial), it could be conducted at the end of the class the week before the material will be instructed. It can then be repeated afterwards to compare with the earlier results. This can help with methods of course material delivery. Students can be asked at the start of the term what they hope to gain from a course. They might also be asked about the effectiveness of a lecture delivery or a learning environment (such as a specific type of classroom). Sometimes it is not evident if students have really absorbed and understood new course material. One effective method to judge their comprehension is to have them put down on paper what they have learned. Putting their responses in a context that is relevant to how it would be used in actual professional practice makes this technique more unique and interesting for students. They understand that it’s goal is to help them practice working towards writing as it may be required in their future careers. Setting an imaginary workplace scenario and having them picture themselves within it familiarizes them with the profession’s characteristics and contextualizes their responses to it. Exploratory writing may or may not be graded. It could be used as a change from a regular in-class quiz. There are some courses in the program where writing is less commonly used, but can still have value for students and the instructor. 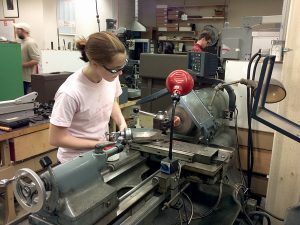 The prototyping courses have students learning and working on machine shop equipment using various materials and techniques to construct actual physical three-dimensional models of their design concepts. A technique that was originally successfully implemented by a colleague to ensure that students have comprehended their work experience and course material, is to have each of them produce a PowerPoint presentation documenting the steps taken in the fabrication of their project from start to finish using photos of the work in progress and explanatory text accompanying the images. This is beneficial to them as they must consider and reflect on the process throughout its duration since they must photo document each step in chronological order as they build their prototype. If they so wish, it also makes for a valuable complementary document for their portfolios, as it helps them to better show and explain their knowledge and experiences with the planning and constructing of models, a common activity in the profession. It is also probable that graduates from other institutions will not have this type of document, thereby giving our graduates a potential advantage in their search for employment. The instructor can see students’ comprehension of the concepts through the visual and written documentation of the procedural steps in a process. This alternative genre assignment is integrated into a third-year course. It follows up on a quick design concept exercise that had subsequently received feedback from other course students the week before. Students were assigned a previously undisclosed one-hour, in-class design concept generation (brainstorming) exercise. After then receiving verbal feedback, in this class they are being assigned to create a user instructions manual for their design concept. They must take the feedback that they received into account and sketch the steps that are required to use their concept. Written descriptive point form instructions must accompany the sketches. The goal is for students to continue to develop their ideas through the consideration and integration of commentary and feedback from classmates into a user manual. It also puts them into the position of the user, preventing them from making assumptions about the understanding of their concept, and seeing it from another perspective than their own as the designer. I started a forum for one of my courses on LÉA with the goal of having students post information and links to information that was relative to the course’s materials. They could help accelerate their learning amongst themselves outside of class time, as the project work was quite time consuming during class. I was also able to use the forum to post information that was relevant to the project. Students in the course were working in groups of two, so this was an appropriate way to have them working more collaboratively as a whole class. It is a good tool to allow students to post thoughts and questions amongst themselves (and to the instructor) as they arise. For some students, it is also a lower stress format than asking questions in class. Answers and discussions are posted and can be revisited and added to as desired, and at any time or from any place, creating a unique archive of the course. Instructions and expectations need to be clearly defined by the instructor at the outset to ensure that only appropriate content is posted. In my experience, I found that to have ‘buy-in’ and more active participation from students, it would be better to assign a small percentage of the course’s grade to each student’s participation in the forum discussion. Following WID principles, this grade is based not on spelling and grammar, but on content and discussion. Students get preoccupied with their work and if they are not used to having this type of format in a course, they may forget about it and not realize it’s potential. I believe that a forum or blog-type activity that accompanies a course can be a very valuable and dynamic component of the learning process for students and instructors. It enables many ways for students to enhance and expand their learning about a subject beyond what the in-class component of a course can accomplish, and I plan on continuing this activity. I prefer and use a chart-style, task-specific, analytic approach to grading students’ work that also integrates standards of the courses’ competencies into the grading scheme. I have a section for general and specific comments which complements the task-specific rubrics, and provides me more latitude with giving targeted feedback that is unique to the project or assignment. Although this method has been working well, sometimes there is frustration with how the grading total for an assignment will not add up to what I ‘feel’ it is worth (as a total grade). This can be the result of the allocation or weighting of task-specific grading that ends up assigning too much importance to one standard over another that may not have been evident before setting up the grading scheme. Interestingly, John Bean has a solution for this kind of problem in his book. He first gives a holistic letter grade (what he feels the work is worth overall), and then inputs numerical grades on his grid or chart rubrics. He then compares the two grading outcomes and reviews the work if the letter and numerical grade do not closely correspond. He then reworks the holistic letter grade if necessary. Or, if an assignment deserves a ‘B’, changes then allow him to reassign the corresponding numerical grading ranges, depending on how the letter grades ranged (e.g. if many ‘A’ letter papers ended up with mid-60s numerical grades). So, for example, based on the letter grades, an ‘A’ might become equal to 63 or above. That is, the numerical grading scheme can be adjusted to better reflect the letter grading or vice versa. I found this solution, which is expanded on and explained in greater depth in his book, to be quite interesting and helpful with resolving this issue when it comes up. Another kind of evaluation that is valuable for students is self-evaluation. Instead of them simply receiving a grade from me, they can also reflect on their own performance with their projects. This is valuable for them as they are asked to think over their work, their methods and performance. They can be asked to consider how or whether they would make any changes to the way that they did the assignment if they were to do it again. They can think about what they learned from their experience and how they can build on it for future projects. Can they think of any ‘failures’ or ‘setbacks’ that they had and how they overcame them? What would they do differently the next time? They can then assign themselves a numerical grade that should correspond to their written answers. All these questions, among others, give students a way to reflect on the process and outcomes of their work after it has been completed. It needs to be submitted before receiving a grade from me, as their self-grading component (value of approximately 5% of total assignment grade) is integrated into the assignment’s overall grade. Additionally, this activity requires a level of maturity to be completed honestly. Self-evaluation exercises help students to build on experiences in a personal way, to evolve their work methods, and gives them a more complete overall review and ownership of their work. I began WID curious and interested, and not too sure where it might lead me. Looking back on the experience and in the creation of my writing portfolio, I found it to be very good and enlightening and provided reflection in ways that I had not envisioned. Readings, blog posts, and discussions with faculty from a variety of disciplines was very interesting. I enjoyed meeting colleagues who I had never met before, and learning about their challenges and solutions to writing in their individual disciplines. The program was led by Anne Thorpe and Ian MacKenzie, and I would like to thank them for their guidance and support throughout the process. They made it possible to see ways in which writing is truly applicable in any discipline, ways that might not have been so evident otherwise. Finally, the accompanying text by John Bean, Engaging Ideas, is an excellent and valuable resource that can be consulted with ease and used for ideas and solutions on a continuous basis.